This is so exciting, guys! There is now a Wacie Nail Company polish you can actually buy. Yes! Julie, the owner of Wishes of a Blue-Eyed Girl and Blue-Eyed Girl Lacquer, is holding a huge charity auction, with dozens of rare, hard to find, and one of a kind polishes up for grabs. One of these is the first-ever Wacie Nail Company polish to actually leave my house. Blue Skies Ahead is a silver linear holo with rainbow flakies that turns blue in sunlight and glows in the dark. Yeah, it does all that! I’m wearing three coats with one coat of Ciate’s Speed Coat Pro top coat. Crazy, right? It’s amazing! 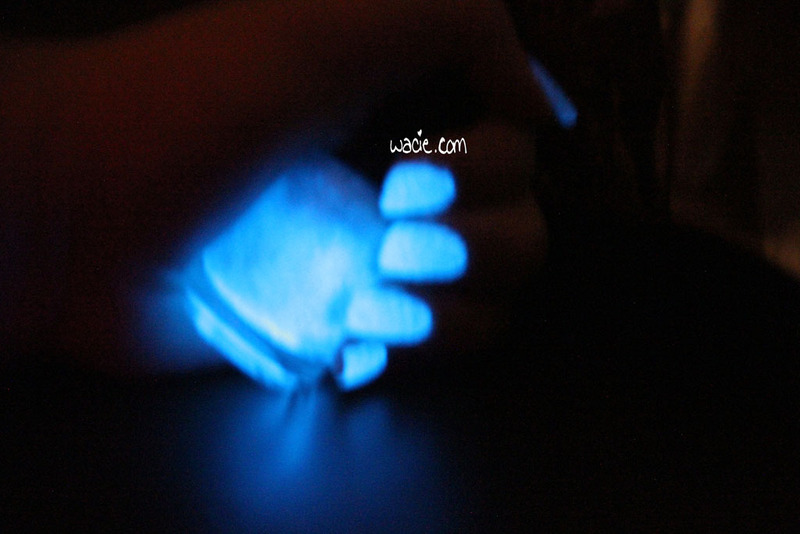 This polish glows really brightly in the dark, and glows blue rather than yellow or green. It only takes a few seconds to charge it up, and it glows for a very long time. There is only one bottle of Blue Skies Ahead available, at it’s up for auction. All of the proceeds of this auction benefit I Need A LightHouse, an organization that raises awareness of depression and suicide prevention education. This is a cause that means a great deal to me, and I really hope you’ll help Julie and me raise lots of money for it. You can find Blue Skies Ahead and the rest of the auction here. Thank you so much.